You’ve moved out to the country (or maybe you still live in town- that’s ok, too!) and you’re all pumped about your new homesteading adventure! This post may contain Amazon affiliate links. Thanks for supporting my blog!! You’re going to get back to the land and not be so dependent on outside forces to keep you going, right?? And one of those new homesteading ventures is to use less electricity! And who doesn’t love the smell of getting into sundried sheets at night after a hard day’s work on the farm??? Let me tell you, though, I see a lot of people who use a clothesline, but don’t know how to use one efficiently. First of all, before you ever hang a stitch of clothing out, you must have the proper set up! Yes, you can get by in a pinch with a rope between two trees, but if you’re really wanting to make line drying a joy rather than a chore, having the proper tools definitely helps! See my aqua pole in the background? After you have your poles, you need the actual clothesline, right? I’m here to tell you, you want plastic covered wire NOT rope! I made the mistake this spring of buying rope (I was in a hurry and not paying attention!). I went ahead and put it up and it is not nearly as good as wire! My clothes sag really bad-especially jeans and overalls and anything else heavy. This is not a camera angle trick! This is the difference between the height of the wire clothesline in the back and a rope clothesline in the front. Note how much the rope sags! And- don’t use uncoated wire because that can cause rust stains on your clothes! 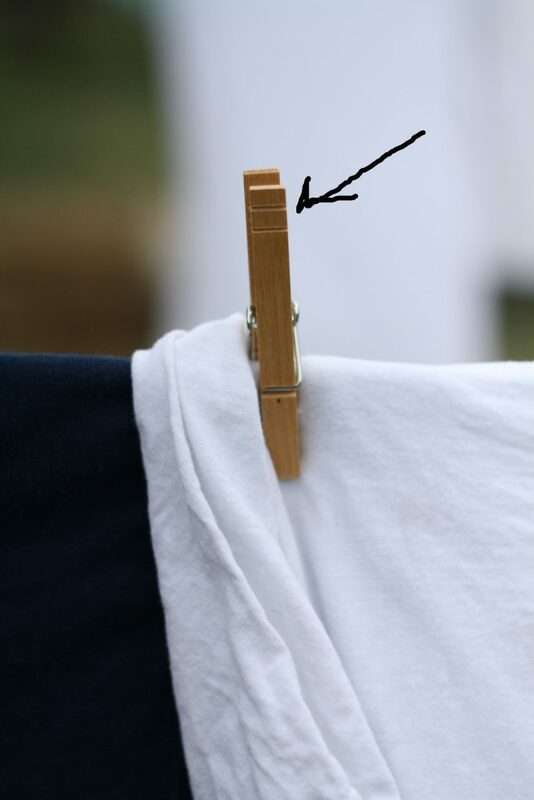 Another important thing is to make sure your clothesline is hung very tight! If it’s not, again you can have the problem of sagging clothes. 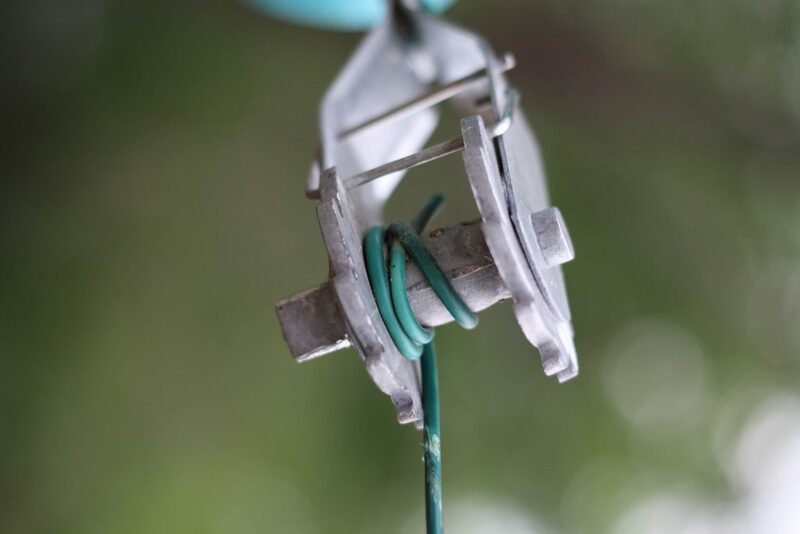 The easiest way to do that is to use a wire tensioner for electric fence. Using one of these also allows you to tighten your clothesline over time because I can guarantee it will start to stretch! After you have your clothesline wire strung on your poles, you’re already to hang your clothes out, right?? You will also need clothes pins! I highly, highly, highly recommend getting the good wooden clothespins. And not all wooden ones are created equal. I have found that the cheap Wal-Mart ones work in a pinch, but don’t hold up as well. I keep my eye out for these…. 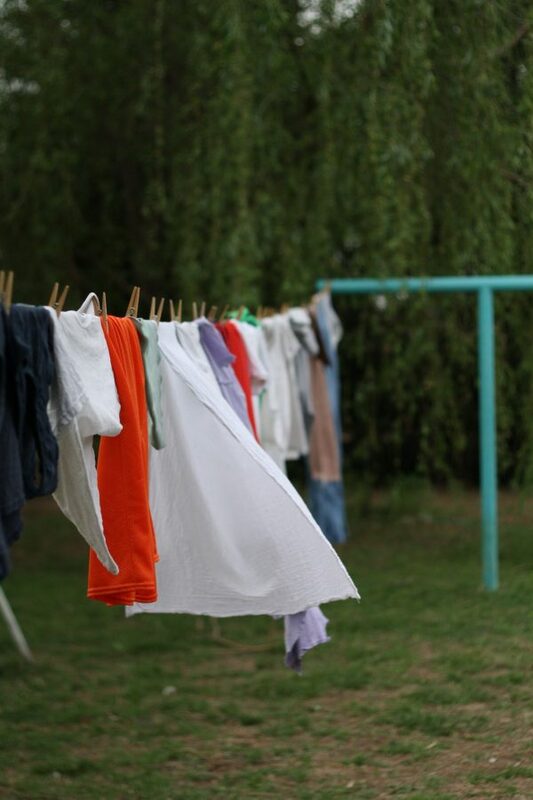 After you get your clothespins, then you are all set to save money, be less dependent on electricty and use your new, awesome clothesline! But, there is an efficient way to use one and a completely inefficient way. 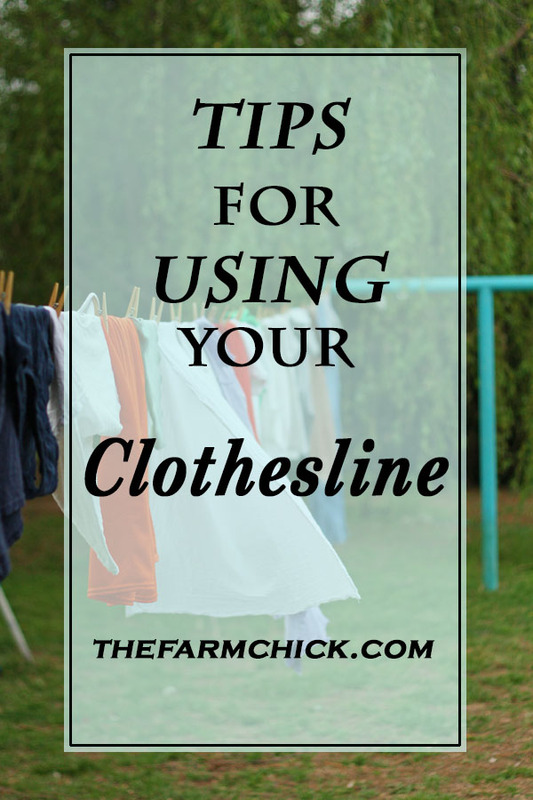 So, let me give you a quick lesson on the best way to USE your clothesline! The most efficient way to hang up your clothes and to maximize your clothesline length is to overlap your clothes as you hang them! 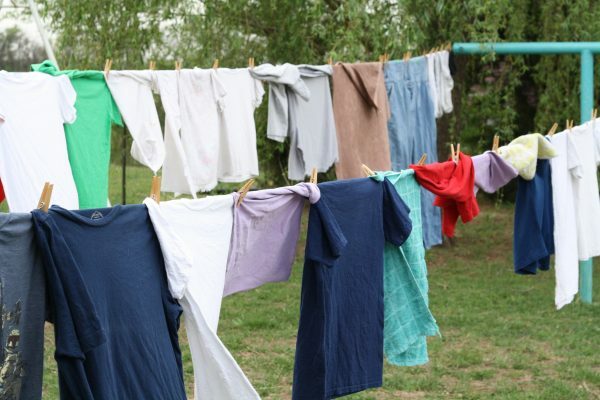 A pet peeve of mine is to see clotheslines being used in the movies and each piece of clothing is taking up enough clothesline real estate to hang a quilt, lol! Now, with heavier fabrics, like denim, I recommend hanging them up without overlapping, otherwise they can take f-o-r-e-v-e-r to dry. I also double over my tea towels. They are really large, but very thin, so they dry just as fast being folded as hung, but take up half the amount of space. Don’t be afraid to experiment a little with hanging your clothes. If you find a way that you and your family prefer, then by all means, do it that way! 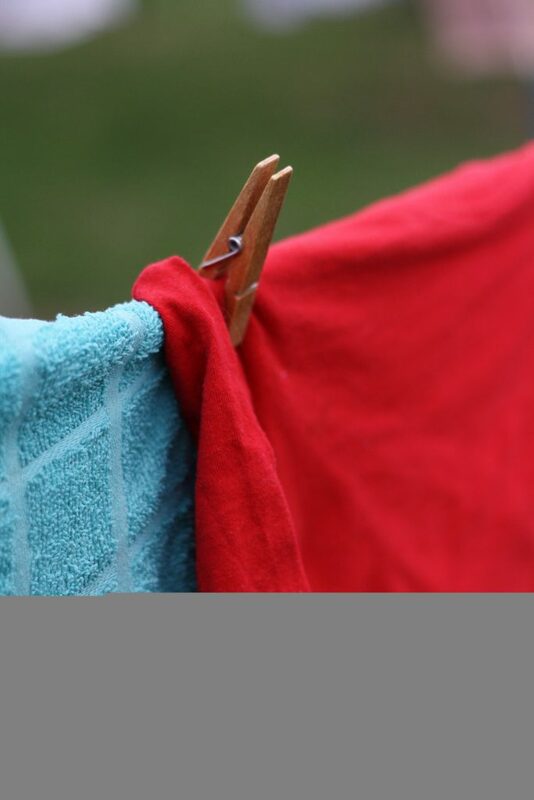 Share with us your clothesline tips! What lessons have your learned?